WEB EXTRA: Jay Parry (BS ’80, finance) serves as President and COO of the WNBA’s Phoenix Mercury, holding an unwavering commitment to the positive potentials of her team and their sport. Portfolio reached Parry for a few thoughts from her office in the U.S. Airways Center. Portfolio: What’s your mission as head of one of the WNBA’s original teams? Jay Parry: I got into the business to make a difference in the only professional women’s team sports league: to help build it and to have it flourish as a community asset. 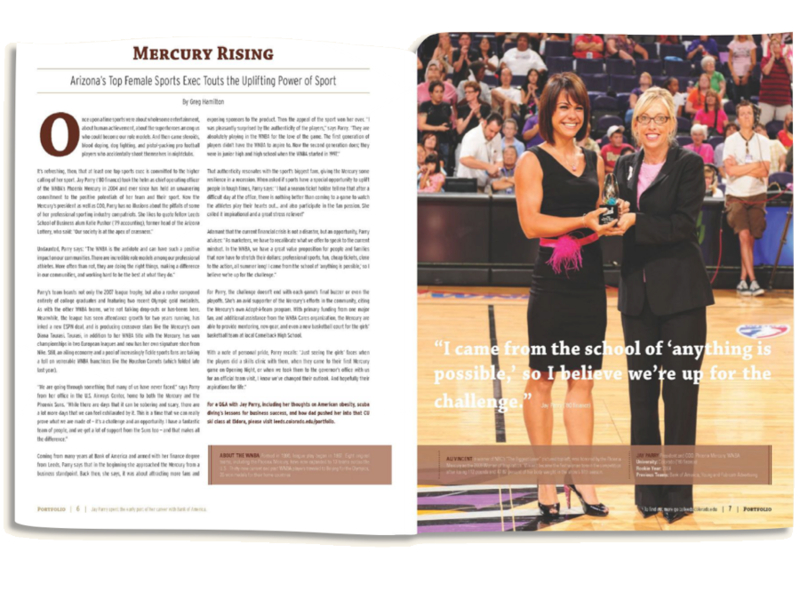 The WNBA and the Phoenix Mercury are about: leading, inspiring, and creating change. That’s something I can get really excited about as a mission statement! P: Do you get hassled in the world of pro hoops for not being a lifelong player? J: I haven’t found that not being a basketball star is a drawback. In fact, it may be just the opposite. I bring a different perspective of what basketball brings to our Arizona community, marketing partners, and fans without being completely enmeshed in the traditions of basketball like some of the purists! As with any business, sometimes we have to separate the passion from the bottom-line to figure out how to differentiate ourselves and build a compelling marketing message. And then of course, weave the passion back into it–because that’s one of the powerful cornerstones of sports: fan avidity. I was brought up in a family where we were always active, in fact my father encouraged me to attend CU so I could learn how to ski! And that ski class at Eldora was very memorable! So I’m a believer in the value of sports at all levels and at all ages. P: Can sports participation and viewership counteract unhealthy American trends like obesity? J: It really is alarming when you hear the stats about childhood obesity (as well as adults) in our country. We do lots of clinics and health/fitness events to get kids and adults up off the couch. There is tons of research that shows when kids are involved in athletics, their self-esteem and confidence is boosted and overall they are more “successful” in life. There is something special about hearing from a professional athlete and it really resonates with kids. P: Do you think it’s possible to create business success without formal schooling? What is the function of a business school if sometimes “success” seems to be about getting lucky? J: I believe that everyone has some luck in their life. I feel like I was lucky to choose CU and then to stumble into the business school. Maybe that’s not the text book answer you were looking for! Most of us don’t exactly know what we want to be when we grow up. So the idea of preparing ourselves, or our children, to the best of our abilities seems like the best way to get ready for what life brings us. There’s a silly little saying that I picked up when I got certified for scuba diving (with a friend from CU after college): “plan the dive and dive the plan.” It fits a lot of circumstances. We certainly make our own success, financial and otherwise, and the business school provided a good foundation and jumping off point for the rest of my life. P: In pursuit of profit, can ethical factors actually weigh in on business decisions? J: There is no doubt in my mind that we can operate with strong business practices AND consider what right for our employees, our environment, and our local communities. We all have to step up and do a little bit (or more) to make a difference. I was lucky to spend the early part of my career with Bank of America. And that provided me a solid foundation in corporate responsibility. I worked with some tremendous leaders that were great mentors and also set a great example for leading people and being involved and giving back to the community. P: What would you whisper in the ear of each new student at the Leeds School? J: Participate: in clubs; class; activities; working with other students, faculty, advisors, etc.. Your ability to effectively work with others and lead groups of people is invaluable. Much more can be accomplished as a team than individually. P: How about its graduating students? J: Build relationships. You will be surprised and excited to find out how your business and personal relationships will mold you and direct you through life. I’m convinced there are way less than six degrees of separation! P: You have been very active in a wide range of volunteerism and advisory boards, from the Diabetes Foundation and an Animal Center to the Super Bowl Host Committee. Is this level of involvement necessary for business leaders? J: I think that everyone should give back in some way. It’s a win-win situation. I definitely get fulfillment and satisfaction out of seeing that I, or my team or players have helped make someone’s life better. In a way, it’s a privilege to be in a situation to volunteer. I feel lucky. One of my favorite Phoenix Mercury programs is Adopt-A-Team. With the help of a big fan, we adopted Camelback High School girls basketball team. For the past year, we have mentored them with life and basketball skills, outfitted them with new gear, and (with the help of WNBA Cares) provided a new, beautiful basketball court at their school. Just seeing the girls’ faces when the players did a skills clinic with them, when they came to their first Mercury game on Opening Night, or when we took them to the governor’s office with us for an official team visit, I know we’ve changed their outlook. And hopefully their aspirations for life. A few years ago I learned of a fantastic quote from Madeline Albright, “there’s a special place in hell for women who don’t help other women.” That is priceless.